Hello everyone!! Welcome to another great iCopic Weekly Challenge! I will be getting the new snazzy buttons added to the sidebar so that our winners can add them easily to their blogs. Create a baby themed project. If you don't feel like using a baby image, feel free to concentrate on baby colors: baby pink, and baby blue. Add a direct link to your challenge project below. Projects are due on October 23rd at noon PST. A winner will be chosen at random to receive this week's prize AND be showcased right here on the iCopic blog Sunday evening! This week's prize is HUGE!!! 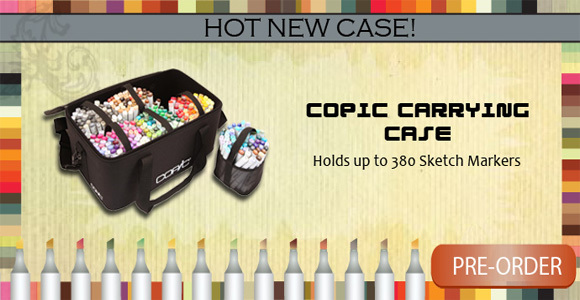 Our lucky winner this week will receive a brand new Copic carrying case! We are currently taking pre-orders for these new cases. Our winner this week will be among the very first people to own one of these! so lovely and beautifully coloured! WOW - this is beautiful! 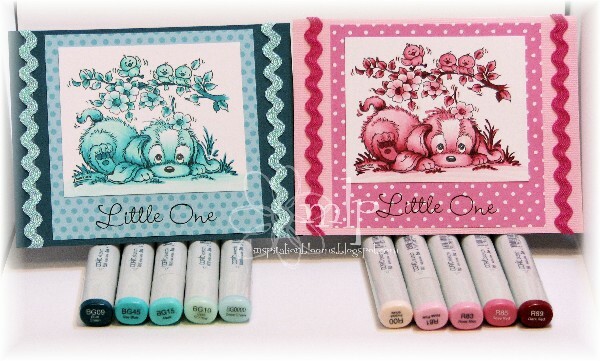 Love those blues and pinks and how adorable are those little puppies! Oh and how fun to have a top 3! Can't wait to be inspired! wow!!!! Those are stunning cards. I'm so excited, I have a baby image colored this is just the inspiration I need to get it on a card. That CASE is a dream for me! Gorgeous cards and a very generous prize! I had been wanting to participate all week! I made it :D Thanks for a great challenge!